The fleet consists of two boats: a cabin cruiser and a day boat. Cheers Patty is a 20-foot Dauntless Boston Whaler; MaryTime is a 30-foot Back Cove. The definition of dauntless sums up the Cheers Patty: fearless and determined. 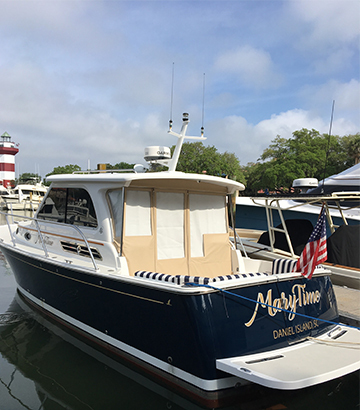 MaryTime is a Downeast boat with a long keel and a soft chine. She’s a classy bellwether. MaryTime is a 30 ft Back Cove yacht. She’s the ideal perfect boat: elegant and sophisticated, sporty and cofortable, rugged (only when needed), attentive, and always shipshape. The MaryTime is ideal for large parties or a small family who wish to cruise in style and comfort. 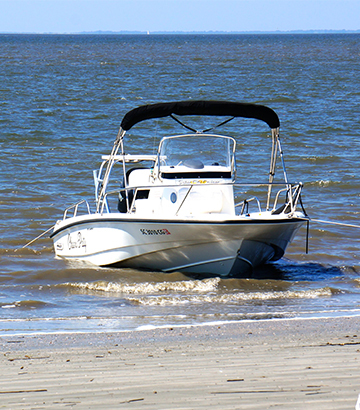 Cheers Patty is a 200 Dauntless Boston Whalerâ€“the ideal day boat. Sheâ€™s named afterÂ Capt. Daveâ€™s sister Patty whose life ended prematurely. Cheers, Patty! We are fortunate to live in such a beautiful part of the South called the Lowcountry. A moniker derived from the fact that most of the area is below sea level. Just to the north and south of Charleston are two natural areas that combined total over 400,000 acres of pristine barrier islands, prolific estuaries, and scenic tidal rivers and creeks. Our goal is to immerse you in this natural beautyâ€“touch it, smell it and swim in it. The jewels of the Lowcountry are found in these narrow and shallow creeks that can be accessed only in a boat thatâ€™s both small in size and draft, i.e., the Cheers Patty. Overnight cruises are on the MaryTime; pricing is per couple, or a small family of three or four. All cruises require a 50% deposit upon booking; the balance due the day of the charter prior to departure. All major credit cards accepted. We do not accept personal checks. The advance deposit will be refunded in the event of severe weather or cancelling two days or more prior to the scheduled charter. Cancellations must be done either by e-mail or over the phone. We will not honor voice and text message cancellations.